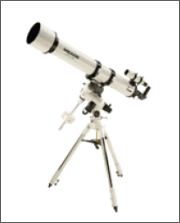 The Meade LXD75 Optical Tube Construction Schmidt-Newtonian and Schmidt-Cassegrain optics are mounted in precision-machined aluminum cells and mounted in sturdy steel tubes which are baked with highgrade textured enamel paint. The optical tube construction Schmidt-Newtonian and Schmidt-Cassegrain optics are mounted in precision-machined aluminum cells and mounted in sturdy steel tubes which are baked with highgrade textured enamel paint. The optical tube assembly is closed, reducing air currents within the tube. This helps prevent distortion of an otherwise sharp image. Additionally, a closed tube assists in keeping the optics clean. Corrector lens fully corrects for spherical aberration and provides pinpoint star images. Water white glass is used in all Schmidt-Newtonian and Schmidt-Cassegrain corrector lenses to maximize light transmission. The use of water white glass results in an increase of light transmission in excess of 10%, as compared to competing telescopes using soda lime glass. Primary mirror premium-grade Pyrex mirrors are used in all Schmidt-Newtonian and Schmidt-Cassegrain optical systems,these provide outstanding thermal stability when compared to many other models that use standard plate glass. Meade’s Schmidt-Newtonians have extremely fast, well corrected f/Ratios for short photographic exposure times and wide fields-of-view, and the 2" focuser Rack and pinion focuser allows the user to achieve a precise focus, accepting both 1.25" and 2" eyepieces. The sturdy Meade LXD75 mount comes with with heavy-duty castings which have been designed and manufactured specifically for high-performance observing and astrophotography. The Meade AutoStar controller helps you quickly find, and GO TO over 30,000 objects in the night sky. View planets, stars, galaxies, nebulae, and comets, all at the push of a button. AutoStar is pre-programmed with several guided tours, including the popular Tonight's Best™. Input date, time and location - then let AutoStar take you on a guided tour of the best objects that particular night.